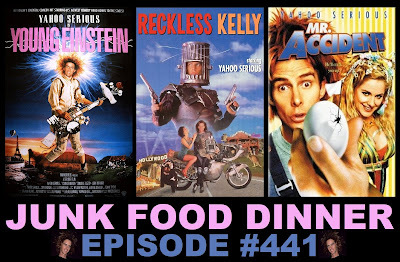 Junk Food Dinner is here to help you celebrate Thanksgiving with three Australian turkeys, compliments of wacky Aussie phenomenon Yahoo Serious. And in order to properly contextualize the work of Mr. Serious, we are joined by actual Australian and long-time listener/caller Tom from Adelaide! Up first, we check out the film that put Yahoo Serious on the map and made him an international superstar, Young Einstein from 1988. In this intentionally fictional account of Albert Einstein's life, Serious plays him as a Tasmanian apple farmer who is trying to put bubbles into beer, invent surfing and create rock 'n roll. Next, in Yahoo's next flick, he again attempts to retell the story of an actual person, this time infamous Australian outlaw Ned Kelly, in a slapstick and cartoonish manner in Reckless Kelly from 1993. And finally, in his third and final film, Yahoo Serious plays an mishap-prone handy man who works at an egg factory and falls in love with an equally goofy girl in Mr. Accident from 2000. All this plus witty banter between friends, tales from the Outback, the new Leprechaun trailer, vape noises, Nerd News, blu-rays and so much more.